We are a leading Manufacturer of digital photo colorimeters, ultraviolet inspection cabinets, uv cabinet, microprocessor karl fischer titrator, medico centrifuge and thermo hygrometer from Mumbai, India. 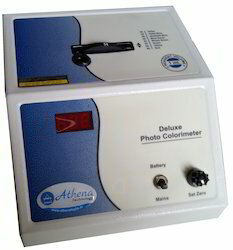 Athena Digital Photo Colorimeters offered is designed to deliver stable, direct readout of absorbance. Available in compact & easy to operate finish, these systems are capable for analyzing any level of concentration of solution and come extensively tested on defined industry parameters by team of experts so as to provide for accurate measurements. Here, we are offering these colorimeters under AT12 Digital Model & AT13 Digital Model that feature std. glass fiATer of 8 & 5, display comprising 2 1/2 Digit LED and range of 400-700 nm. Also having output OD (0 to 1.99) and resolution OD of 0.01, the system can deliver accuracy of 0.5% FSI and feature Selenium Photocell based detector support. We also offer it with accessories support comprising Test Tube set of 5, Spare Lamp, Dust Cover, Manual. With an objective to fulfill the demands of our clients, we are engaged in offering a wide range of Ultraviolet Inspection Cabinets. These cabinets find application for viewing of paper as well as thin layer chromatograms as well as visualization of test objectives under Tubes with long wave length of 365 mm, short wave length of 254 mm as desired by the customers. Under the vigilance of adroit professionals, these cabinets are manufactured using superior quality components and sophisticated techniques at our sound manufacturing unit. With our in-depth knowledge and experience of this industry, we are engaged in providing an excellent range of UV Cabinet. This cabinet is used for viewing and detecting separated substances on T.L.C. layers fitted with long wave. Using quality assured components and progressive techniques in accordance with defined industry norms, this cabinet is manufactured by our diligent engineers at our well-equipped production unit. The provided cabinet is broadly used in various types of industries. Large illumination Area. Epoxy painted Dual wave having imported filters fitted below low pressure mercury vapour tubes for short U.V. (254 nm) and long U.V. (355 nm) Plus separate tube for white light. Provides extremely high irradiation to examine weakly excitable samples, strong mild steel (M.S.) body epoxy coated by electrostatic powder-spray and fusion by heat, with barrier filter and interlocked cover for eye safety and safety against irradiation of operator. Window area 50x 75 mm for middle wave 302 ultra violet having 2 MID-UV tubes fitted with high efficiency UV filter to prevent visible light from UV sources reaching the sample and thereby allowing the faintest fluorescence phenomenon to be detected. Microprocessor KF Moisture Titrator, is the finest volumetric titrator available. It uses the latest microcontroller technology and advanced engineering techniques so as to give enhanced accuracy and reproducibility. The system has user friendly prompts which guide you throughout the titration process. This titrator eliminates the use of conventional delicate and fragile glass burettes and plunger systems. It uses a highly sensitive motorized dispensing system for precise control of titrant volumes. This titrator analyses the moisture concentration of liquid samples, powder, fine particles and fiber samples that are soluble in alcohol or solvents. 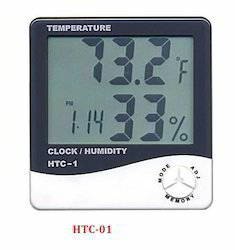 The moisture content is displayed in ppm, %age and mg H2O. The system has 24 soft touch membrane type keys for ease of operation. Complete numeric keypad is provided so as to feed the values of sample, density, titer factor, date, time etc. comfortable. The End Point indication is given by both visual LED and audible alarm. 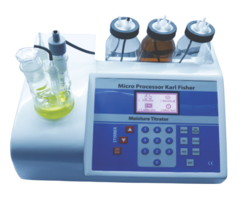 The titrator has the facility for automatically calculating the titer factor of the Karl Fischer reagent. It uses the repeated averaging method so as to give the most accurate titer value. It has the storage facility of date, time, batch no. and final results of 20 titrations using the FIFO method. Auto Computation of Moisture in ppm, % mg H2O. Karl Fischer Volumetric Titration method. Highly sensitive motorized dispensing system. 8 digit bright red seven segment display. In-built Magnetic stirrer with adjustable speed. External Serial printer interface available. 230V A.C ± 10% 50 Hz. With our rich industry experience in this domain we are able to offer our clients a vast assortment of Medico Centrifuge with supreme quality. 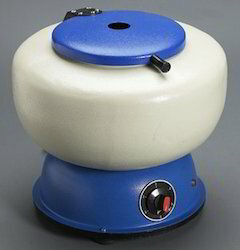 This centrifuge is used in pathology labs, small hospitals, schools and colleges. 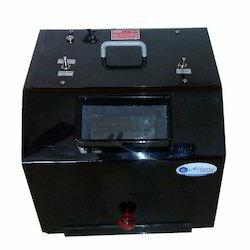 This centrifuge is made available in extensive ranges and several specifications. 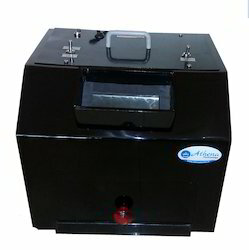 Our offered centrifuge is developed and manufactured making use of the best quality components and modern techniques. The provided centrifuge is quality tested under the guidance of our experts on numerous parameters to ensure its flawlessness.